History (from historians. Events occurring prior to written record are considered prehistory. Stories common to a particular culture, but not supported by external sources (such as the tales surrounding King Arthur), are usually classified as cultural heritage or legends, because they do not show the "disinterested investigation" required of the discipline of history. Herodotus, a 5th-century BCE Greek historian is considered within the Western tradition to be the "father of history", and, along with his contemporary Thucydides, helped form the foundations for the modern study of human history. Their works continue to be read today, and the gap between the culture-focused Herodotus and the military-focused Thucydides remains a point of contention or approach in modern historical writing. In Asia, a state chronicle, the Spring and Autumn Annals was known to be compiled from as early as 722 BCE although only 2nd century BCE texts survived. The word history comes ultimately from Ancient Greek ἱστορία (historía), meaning "inquiry","knowledge from inquiry", or "judge". It was in that sense that Aristotle used the word in his Περὶ Τὰ Ζῷα Ἱστορίαι (Perì Tà Zôa Ηistoríai "Inquiries about Animals"). The ancestor word ἵστωρ is attested early on in Homeric Hymns, Heraclitus, the Athenian ephebes' oath, and in Boiotic inscriptions (in a legal sense, either "judge" or "witness", or similar). The Greek word was borrowed into Classical Latin as historia, meaning 'investigation, inquiry, research, account, description, written account of past events, writing of history, historical narrative, recorded knowledge of past events, story, narrative'. 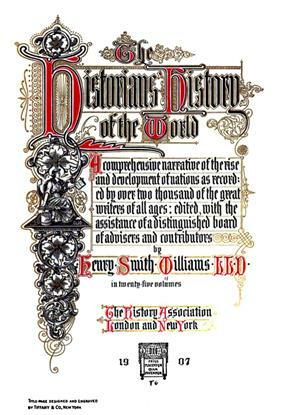 History was borrowed from Latin (possibly via Old Irish or Old Welsh) into Old English as stær ('history, narrative, story'), but this word fell out of use in the late Old English period. Meanwhile, as Latin became Old French (and Anglo-Norman), historia developed into forms such as istorie, estoire, and historie, with new developments in the meaning: 'account of the events of a person's life (beginning of the 12th cent. ), chronicle, account of events as relevant to a group of people or people in general (1155), dramatic or pictorial representation of historical events (c1240), body of knowledge relative to human evolution, science (c1265), narrative of real or imaginary events, story (c1462)'. It was from Anglo-Norman that history was borrowed into Middle English, and this time the loan stuck. It appears in the thirteenth-century Ancrene Riwle, but seems to have become a common word in the late fourteenth century, with an early attestation appearing in John Gower's Confessio Amantis of the 1390s (VI.1383): 'I finde in a bok compiled | To this matiere an old histoire, | The which comth nou to mi memoire'. In Middle English, the meaning of history was "story" in general. The restriction to the meaning 'the branch of knowledge that deals with past events; the formal record or study of past events, esp. human affairs' arose in the mid-fifteenth century. With the Renaissance, older senses of the word were revived, and it was in the Greek sense that Francis Bacon used the term in the late sixteenth century, when he wrote about "Natural History". For him, historia was "the knowledge of objects determined by space and time", that sort of knowledge provided by memory (while science was provided by reason, and poetry was provided by fantasy). In an expression of the linguistic synthetic vs. analytic/isolating dichotomy, English like Chinese (史 vs. 诌) now designates separate words for human history and storytelling in general. In modern German, French, and most Germanic and Romance languages, which are solidly synthetic and highly inflected, the same word is still used to mean both "history" and "story". The adjective historical is attested from 1661, and historic from 1669. 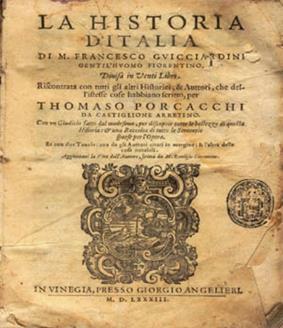 The title page to"La Historia d'Italia"
There were historical traditions and sophisticated use of historical method in ancient and medieval China. The groundwork for professional historiography in East Asia was established by the Han Dynasty court historian known as Sima Qian (145–90 BC), author of the Shiji (Records of the Grand Historian). For the quality of his written work, Sima Qian is posthumously known as the Father of Chinese Historiography. Chinese historians of subsequent dynastic periods in China used his Shiji as the official format for historical texts, as well as for biographical literature. philosophy and a more secular approach in historical study. In the West, historians developed modern methods of historiography in the 17th and 18th centuries, especially in France and Germany. The 19th-century historian with greatest influence on methods was Leopold von Ranke in Germany. In the 20th century, academic historians focused less on epic nationalistic narratives, which often tended to glorify the nation or great men, to more objective and complex analyses of social and intellectual forces. A major trend of historical methodology in the 20th century was a tendency to treat history more as a social science rather than as an art, which traditionally had been the case. 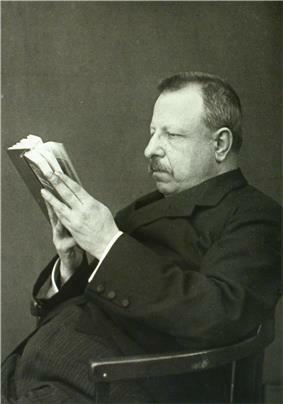 Some of the leading advocates of history as a social science were a diverse collection of scholars which included Fernand Braudel, E. H. Carr, Fritz Fischer, Emmanuel Le Roy Ladurie, Hans-Ulrich Wehler, Bruce Trigger, Marc Bloch, Karl Dietrich Bracher, Peter Gay, Robert Fogel, Lucien Febvre and Lawrence Stone. Many of the advocates of history as a social science were or are noted for their multi-disciplinary approach. Braudel combined history with geography, Bracher history with political science, Fogel history with economics, Gay history with psychology, Trigger history with archaeology while Wehler, Bloch, Fischer, Stone, Febvre and Le Roy Ladurie have in varying and differing ways amalgamated history with sociology, geography, anthropology, and economics. More recently, the field of digital history has begun to address ways of using computer technology to pose new questions to historical data and generate digital scholarship. In opposition to the claims of history as a social science, historians such as social history to emerge in the post-WWII era was Alltagsgeschichte (History of Everyday Life). Scholars such as Martin Broszat, Ian Kershaw and Detlev Peukert sought to examine what everyday life was like for ordinary people in 20th-century Germany, especially in the Nazi period. Eugene D. Genovese, Isaac Deutscher, C. L. R. James, Timothy Mason, Herbert Aptheker, Arno J. Mayer and Christopher Hill have sought to validate Karl Marx's theories by analyzing history from a Marxist perspective. In response to the Marxist interpretation of history, historians such as François Furet, Richard Pipes, J. C. D. Clark, Roland Mousnier, Henry Ashby Turner and Robert Conquest have offered anti-Marxist interpretations of history. Feminist historians such as Joan Wallach Scott, Claudia Koonz, Natalie Zemon Davis, Sheila Rowbotham, Gisela Bock, Gerda Lerner, Elizabeth Fox-Genovese, and Lynn Hunt have argued for the importance of studying the experience of women in the past. In recent years, postmodernists have challenged the validity and need for the study of history on the basis that all history is based on the personal interpretation of sources. In his 1997 book In Defence of History, Richard J. Evans, a professor of modern history at Cambridge University, defended the worth of history. Another defence of history from post-modernist criticism was the Australian historian Keith Windschuttle's 1994 book, The Killing of History. The Marxist theory of historical materialism theorises that society is fundamentally determined by the material conditions at any given time – in other words, the relationships which people have with each other in order to fulfil basic needs such as feeding, clothing and housing themselves and their families. Overall, Marx and Engels claimed to have identified five successive stages of the development of these material conditions in Western Europe. Marxist historiography was once orthodoxy in the Soviet Union, but since the collapse of communism there in 1991, Mikhail Krom says it has been reduced to the margins of scholarship. Marx observed that each stage or epoch created a new class or invention that would lead to its downfall. However the downfall would not be an automatically negative event, since with each step humanity at large would benefit. Each passing stage would therefore raise the standard of living of the masses while at the same time be doomed to its own downfall because of internal contradictions and class conflicts. The first three stages are not given particular attention, since by Marx's time they had long come to pass. As such, he does not provide the principles of these stages as he does for capitalism and the stages that follow. Nonetheless, these epochs have common characteristics. Historical study often focuses on events and developments that occur in particular blocks of time. Historians give these  The names given to a period can vary with geographical location, as can the dates of the start and end of a particular period. Centuries and decades are commonly used periods and the time they represent depends on the dating system used. Most periods are constructed retrospectively and so reflect value judgments made about the past. The way periods are constructed and the names given to them can affect the way they are viewed and studied. The field of history generally leaves prehistory to the archaeologists, who have entirely different sets of tools and theories. The usual method for periodisation of the distant prehistoric past, in archeology is to rely on changes in material culture and technology, such as the Stone Age, Bronze Age and Iron Age and their sub-divisions also based on different styles of material remains. Despite the development over recent decades of the ability through radiocarbon dating and other scientific methods to give actual dates for many sites or artefacts, these long-established schemes seem likely to remain in use. In many cases neighbouring cultures with writing have left some history of cultures without it, which may be used. Hunting and gathering: tribal societies have yet to develop large scale agriculture and so their survival is a daily struggle. Proto-democracy: there is usually no concept of "leadership" yet. So tribes are led by the best warrior if there is war, the best diplomat if they have steady contact with other tribes and so forth. Class: here the idea of class appears. There is always a slave-owning ruling class and the slaves themselves. Marx pays special attention to this stage in human development. The bulk of his work is devoted to analysing the mechanisms of capitalism, which in western society classically arose "red in tooth and claw" from feudal society in a revolutionary movement. In capitalism, the profit motive rules and people, freed from serfdom, work for the capitalists for wages. The capitalist class are free to spread their laissez faire practices around the world. In the capitalist-controlled parliament, laws are made to protect wealth. Private property: The means of production are no longer in the hands of the monarchy and its nobles, but rather they are controlled by the capitalists. The capitalists control the means of production through commercial enterprises (such as corporations) which aim to maximise profit. Wages: In capitalism, workers are rewarded according to their contract with their employer. Power elites propagate the illusion that market forces mean wages converge to an equilibrium at which workers are paid for precisely the value of their services. In reality workers are paid less than the value of their productivity — the difference forming profit for the employer. In this sense all paid employment is exploitation and the worker is "alienated" from their work. Insofar as the profit-motive drives the market, it is impossible for workers to be paid for the full value of their labour, as all employers will act in the same manner. Council democracy: Marx, basing himself on a thorough study of Paris Commune, believed that the workers would govern themselves through system of communes. He called this the dictatorship of the proletariat, which, overthrowing the dictatorship (governance) of capital, would democratically plan production and the resources of the planet. Particular geographical locations can form the basis of historical study, for example, continents, countries and cities. Understanding why historic events took place is important. To do this, historians often turn to geography. Weather patterns, the water supply, and the landscape of a place all affect the lives of the people who live there. For example, to explain why the ancient Egyptians developed a successful civilization, studying the geography of Egypt is essential. Egyptian civilization was built on the banks of the Nile River, which flooded each year, depositing soil on its banks. The rich soil could help farmers grow enough crops to feed the people in the cities. That meant everyone did not have to farm, so some people could perform other jobs that helped develop the civilization. History of South Asia is the study of the past passed down from generation to generation in the Sub-Himalayan region. The history of religion has been a main theme for both secular and religious historians for centuries, and continues to be taught in seminaries and academe. Leading journals include Church History, Catholic Historical Review, and History of Religions. Topics range widely from political and cultural and artistic dimensions, to theology and liturgy. This subject studies religions from all regions and areas of the world where humans have lived. diplomatic history replaced constitutional history as the flagship of historical investigation, at once the most important, most exact and most sophisticated of historical studies. She adds that after 1945, the trend reversed, allowing social history to replace it. Although economic history has been well established since the late 19th century, in recent years academic studies have shifted more and more toward economics departments and away from traditional history departments. ^ Joseph, Brian (Ed. ); Janda, Richard (Ed.) (2008). The Handbook of Historical Linguistics. Blackwell Publishing (published 30 December 2004). p. 163. ^ "What is History & Why Study It?". Retrieved 21 January 2014. ^ Peter N. Stearns, Peters Seixas, Sam Wineburg (eds. ), ed. (2000). "Introduction". Knowing Teaching and Learning History, National and International Perspectives. New York & London: New York University Press. p. 6. ^ Nash l, Gary B. (2000). "The "Convergence" Paradigm in Studying Early American History in Schools". In Peter N. Stearns, Peters Seixas, Sam Wineburg (eds.). Knowing Teaching and Learning History, National and International Perspectives. New York & London: New York University Press. pp. 102–115. ^ Seixas, Peter (2000). "Schweigen! die Kinder!". In Peter N. Stearns, Peters Seixas, Sam Wineburg (eds.). Knowing Teaching and Learning History, National and International Perspectives. New York & London: New York University Press. p. 24. ^ Lowenthal, David (2000). "Dilemmas and Delights of Learning History". In Peter N. Stearns, Peters Seixas, Sam Wineburg (eds.). Knowing Teaching and Learning History, National and International Perspectives. New York & London: New York University Press. p. 63. ^ a b c "history, n." OED Online. Oxford University Press, December 2014. Web. 9 March 2015. ^ Cf. "history, n." OED Online. Oxford University Press, December 2014. Web. 9 March 2015. ^ a b Whitney, W. D. The Century dictionary; an encyclopedic lexicon of the English language. New York: The Century Co, 1889. ^ WordNet Search – 3.0, "History". ^ Ritter, H. (1986). Dictionary of concepts in history. Reference sources for the social sciences and humanities, no. 3. Westport, Conn: Greenwood Press. Page 416. ^ a b Graham, Gordon (1997). "Chapter 1". The Shape of the Past. ^ a b Lamberg-Karlovsky, C. C. and Jeremy A. Sabloff (1979). Ancient Civilizations: The Near East and Mesoamerica. Benjamin-Cummings Publishing. p. 5. ^ Lamberg-Karlovsky, C. C. and Jeremy A. Sabloff (1979). Ancient Civilizations: The Near East and Mesoamerica. Benjamin-Cummings Publishing. p. 6. ^ Ibn Khaldun, Franz Rosenthal, N. J. Dawood (1967), The Muqaddimah: An Introduction to History, p. x, Princeton University Press, ISBN 0-691-01754-9. ^ Enan, Muhammed Abdullah (2007). Ibn Khaldun: His Life and Works. ^ Charles Taylor, "Critical Notice", Canadian Journal of Philosophy 10 (1980), p. 330. ^ Pavkovic, Michael; Morillo, Stephen (2006). What is Military History?. Oxford: Polity Press (published 31 July 2006). pp. 3–4. ^ Reba Soffer, "Nation, duty, character and confidence: history at Oxford, 1850–1914." Historical Journal (1987) 30#01 pp: 77-104. ^ "Blackwell-Synergy.com". Blackwell-Synergy.com. Retrieved 2010-05-16. In 21st-century Germany, the history curriculum is controlled by the 16 states, and is characterized not by superpatriotism but rather by an "almost pacifistic and deliberately unpatriotic undertone" and reflects "principles formulated by international organizations such as UNESCO or the Council of Europe, thus oriented towards human rights, democracy and peace." The result is that "German textbooks usually downplay national pride and ambitions and aim to develop an understanding of citizenship centred on democracy, progress, human rights, peace, tolerance and Europeanness." In many countries history textbooks are sponsored by the national government and are written to put the national heritage in the most favorable light. For example, in Japan, mention of the Nanking Massacre has been removed from textbooks and the entire Second World War is given cursory treatment. Other countries have complained. It was standard policy in communist countries to present only a rigid Marxist historiography. In most countries history textbook are tools to foster nationalism and patriotism, and give students the official line about national enemies. From the origins of national school systems in the 19th century, the teaching of history to promote national sentiment has been a high priority. In the United States after World War I, a strong movement emerged at the university level to teach courses in Western Civilization, so as to give students a common heritage with Europe. In the U.S. after 1980 attention increasingly moved toward teaching world history or requiring students to take courses in non-western cultures, to prepare students for life in a globalized economy. A major intellectual battle took place in Britain in the early twentieth century regarding the place of history teaching in the universities. At Oxford and Cambridge, scholarship was downplayed. Professor Charles Harding Firth, Oxford's Regius Professor of history in 1904 ridiculed the system as best suited to produce superficial journalists. The Oxford tutors, who had more votes than the professors, fought back in defense of their system saying that it successfully produced Britain's outstanding statesmen, administrators, prelates, and diplomats, and that mission was as valuable as training scholars. The tutors dominated the debate until after the Second World War. It forced aspiring young scholars to teach at outlying schools, such as Manchester University, where T.F. Tout was professionalising the History undergraduate programme at by introducing the study of original sources and requiring the writing of a thesis. Historiometry is a historical study of human progress or individual personal characteristics, by using statistics to analyze references to eminent persons, their statements, behavior and discoveries in relatively neutral texts. A people's history is a type of historical work which attempts to account for historical events from the perspective of common people. A people's history is the history of the world that is the story of mass movements and of the outsiders. Individuals or groups not included in the past in other type of writing about history are the primary focus, which includes the disenfranchised, the oppressed, the poor, the nonconformists, and the otherwise forgotten people. This history also usually focuses on events occurring in the fullness of time, or when an overwhelming wave of smaller events cause certain developments to occur.